Manchester United boss Jose Mourinho has taken a fresh swipe at club officials this weekend while praising Juventus’ business model. The Red Devils succumbed to a disappointing 1-0 defeat at Old Trafford against the Italian champions in Europe on Tuesday, after Paulo Dybala scored the only goal of the game in the first half. The result marked United’s fifth defeat of the season already in all competitions as fears grow amongst supporters that the team will fail to challenge for major trophies over the next few months. 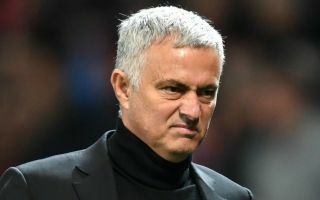 Mourinho only managed to sign Fred, Diogo Dalot and Lee Grant over the summer and none of them have been regulars in the starting XI since, as the Portuguese boss has had to make to do with largely the same crop of players which secured a second-place Premier League finish last term. According to the Daily Telegraph, Mourinho has taken another subtle dig at the United board, insisting that Juventus have had the funds available to win trophies over the last seven years, which is the key reason behind their success. “So they won seven in a row [Serie A titles], but they bought Cristiano and Bonucci and Can and Cancelo, so they always want more and more and more,” The 55-year-old coach told reporters, as per the Telegraph. “I think the objective of the club is happiness related to football results. They are going to chase that treble. Mourinho then went on to bemoan the fact that club chiefs failed to heed his warning about spending money during in the last transfer window, adding: “My belief is that you did not take me seriously when I said that the second position last season was a phenomenal position for us and that this season was going to be difficult. The Red Devils are set to face Everton at Old Trafford on Sunday and they must win to reduce the gap between themselves and league leaders Liverpool back down to nine points. A lack of signings or not, Mourinho still has plenty of talent at his disposal and if he doesn’t start to get the best out of his misfiring stars soon, he could well pay for it with his job.